Made from a slice of think bamboo this rustic guiro has satisfyingly chunky ridges which produce a rich, percussive noise when rubbed with the attached striker. The guiro has been finished with a simple burnt etching technique and dot painting. 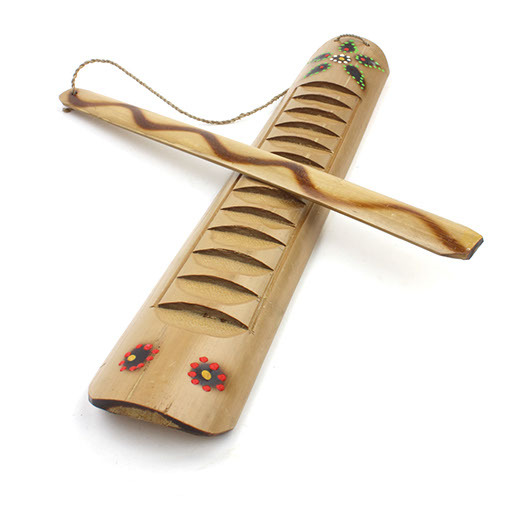 Our bamboo guiros are hand made in Bali using fast growing and inexpensive bamboo. As a result of this they can be sold at a lower price and also do not effect the level of hardwood forests making their production more environmentally friendly.